Tim Holtz Cling Rubber Stamps ATTIC TREASURES CMS123 at Simon Says STAMP! CMS123 / 3.8 This item is on reserve until If you would like to reserve this item now, you may purchase it now with the rest of your order. We will hold your order now and ship your entire order as soon as this item is back into stock. If you would like your order to ship now, please place this item on a separate order. To use this awesome feature, you need to be logged in to our system! You do not have any subscriptions to add this item to! Success, Tim Holtz Cling Rubber Stamps ATTIC TREASURES CMS123 has been shared! Oops, check your form fields and try again! Send a link to this page to a friend with the form below! Simon Says Stamp strives to be your one stop shop for everything Tim Holtz! This brand new stamp set has thick foam with deeply etched rubber. These rubber stamps cling mount to any clear acrylic block (clear blocks are not included in this sale, but are available through our store! ).What a space saver! Part of a line of stamps designed by Tim Holtz, these unmounted stamps are made in OHIO, USA by Stampers Anonymous. Check out our store for coordinating items like tags, ink, art parts, die cutting plates, even grungepaper!The stamps are also neatly trimmed, deeply etched, magnificent quality and made in the USA. The stamp sheet measures approximately 7 by 8.5 inches. As a crafter for many years, Tim Holtz enjoys the creative process of making things as well as playing an integral part in the development and design of cutting edge products. His eye for creating products that work together synergistically is genius. 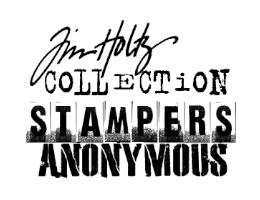 Tim Holtz stamps for Stampers Anonymous are proudly made in the USA! Get a Back in Stock Notification! Fill out the little form below to find out when more arrives! If you already have an account with Simon Says Stamp! Please enter your email address and password to login. Registering provides you with significant benefits when shopping here. You can save your cart for return visits, you can use the express lane during checkout, as well as other great features. Password* Must be between 6-20 characters, one upper and lower case letter, and one number.